It is an era of difficult choices for young vocalists, but the ones that follow their heart are certainly the better for it. 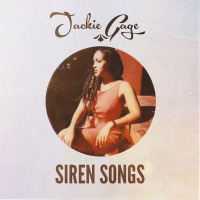 Jackie Gage is a determined singer who self-produced Siren Songs as a commitment toward her career in jazz. The production features a refined string quartet, augmenting the rhythm section, but the highlight is Gage's genuinely gifted vocals. The title track is a brief instrumental introduction with soft vocal texture joining the marimba in a luring invitation, before going into "That Old Black Magic." This familiar standard is literally rejuvenated, as Gage delivers with a light and breezy intent. The marimbas of Dillon Vado, again do the intro honors on the original "It's Your Love," and keep an exotic rhythm swaying around the lyrics. The string quartet is featured on "Mine," another Gage composition, which displays sophistication and finesse. "Curious," is an interlude leading into the violin lamentations of "Serves Me Right," the kind of torch song that Gage is connected with back in her San Jose hometown. Being a California girl who sings jazz has been an asset as she certainly stood out from the other artists. Her rendition of "Comes Love," displays a maturity in her song selections as well as confidence in her ability to cover such a perennial classic with authority. Most people would associate "Afro Blue," with a hard hitting Latin jazz outfit, or a straight ahead horn section, but Gage turns this band stand favorite into a personal vehicle of expression and grace. Pianist Timothy Wat does excellent comping and setting up the accompaniment for Gage to lean on. Gage also penned "Sweet," which is as the name implies, a dulcet ode to love. Special reference must go to Joshua Washington for the strings and vocal arrangements, which really dress up the production. As mentioned, Jackie Gage hails from San Jose, California, and has relocated to New York City, where jazz has its own realm, in hopes of fulfilling a dream. She prepared herself with some serious performance tours in her home state, especially the Bay Area, which is known for its hip audiences, and Siren Songs is her calling card. If this is just the start, stay tuned for much more from jazz singer Jackie Gage. Track Listing: Siren Songs; That Old Black Magic; It’s Your Love; Mine; Curious; Serves Me Right; Comes Love; Afro Blue; Sweet. Personnel: Jackie Gage: vocals; Timothy Wat: piano; John Shifflett: bass; Dillon Vado: marimba; Jason Lewis: drums; Ilana Thomas: 1st violin; Su Buchignani: viola; Kristina Dutton: 2nd violin; Freya Seeburger: cello.